That’s the question I got from my little brother as we were talking about a few investment ideas for his family. It’s a thought that many investors have. After all, no one wants to put their hard-earned money into the market only to see stocks pull back in price. And considering how long stocks have been moving higher, isn’t it reasonable to expect a big pullback soon? One that virtually ensures that the next market pullback will be small and very short lived. As I chatted with my brother, the first thing I explained was that markets move higher or lower because of people buying or selling. It’s a basic concept for investors, but certainly one that is worth reviewing. The more money is spent buying stocks, the higher prices go. That’s because some shareholders are only willing to sell at a higher price. So the more shares that are bought, the higher the price naturally goes. Next, we talked about who the big buyers and sellers are. Often individual investors cause small moves in the market because they buy and sell relatively small amounts of stock. But when big investors like pensions, endowments, and mutual funds buy stocks, they can move the market significantly! Big buy orders from these institutional investors can cause the market to trade higher very quickly. And since these investors often take a lot of time to buy all of the shares that they want, institutional investors can also keep the market moving higher for an extended period of time. So it pays to be on the side of the biggest investors, and to be invested before their big buy orders hit the market. Once we got the groundwork covered, I then pulled out a simple picture that explains why I’m not concerned about a market pullback anytime soon. Private equity investors are the 800-pound gorillas when it comes to institutional investors. These financial companies take money from the very biggest investment firms and figure out where to put it to work. Sometimes they buy real estate, sometimes they buy stocks, and sometimes they buy entire companies outright! 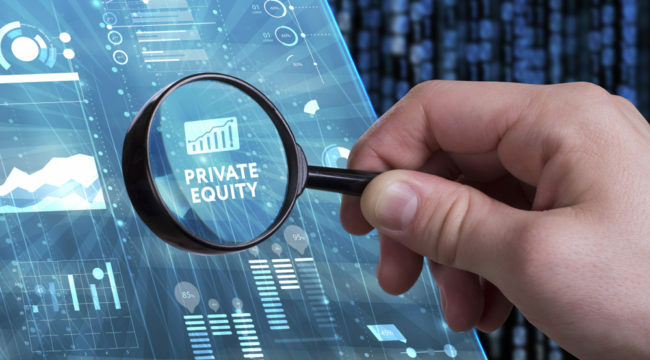 I always pay attention to what these private equity companies are doing, because their buy and sell orders have a huge effect on where the market is headed. In particular, I watch how much available cash — or “dry powder” — these companies are holding. Because the more dry powder in play, the more anxious private equity companies are to invest their money. After all, these firms only generate fees from the money that is actually invested. So to make a profit, these companies have to put that money to work! 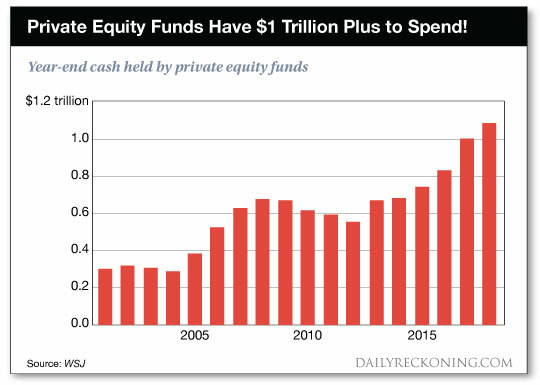 The line at the far right hand side shows us that private equity firms now have well over $1 trillion available to invest. To put that number into perspective, the entire U.S. stock market is worth a bit less than $30 trillion.1 So these firms have enough cash to make a serious change to the entire U.S. stock market! Why is this important to us as investors? Because this $1 trillion acts as a virtual backstop for the market. Whenever stocks pull back, you can bet your life that the Ivy League managers at these private equity firms are pouring over the market looking for places to put their capital to work. And the farther stocks potentially fall, the more money these guys will put to work. Remember, these private equity companies have a huge incentive to invest their capital. Because without making new investments, these firms can’t continue to generate profits. Also remember that when these firms put their cash to work, they’ll naturally drive the market higher. After all, the more money invested in U.S. stocks, the higher stock prices trade. It’s no coincidence that the market has continued to trade higher as private equity dry powder has grown. Because the more these companies invest, the higher the market moves.